Yield: one 9 to 10-inch/23 to 25 cm cake (spring-form or tube pan). 1. Heat the oven to 350°F/180°C. Grease and line the cake tin. 2. Separate the eggs into two bowls. Beat the yolks with the sugar and zests, then stir in the almonds. Beat the whites to peaks. Stir a spoonful into the yolk mixture, then fold in the rest, gently. Pour the batter into the pan and bake until set, about 45 minutes. Let cool slightly, then unmould onto a serving platter. 1. Heat the juice and sugar together in a saucepan and boil five minutes. Stir in the liqueur if using. Spoon evenly over the cake, letting the syrup soak in as you go (it will absorb all of it). 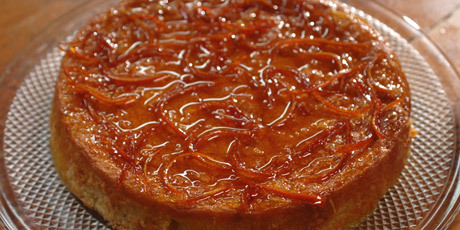 Serve the cake with candied orange zest on top and whipped cream on the side.